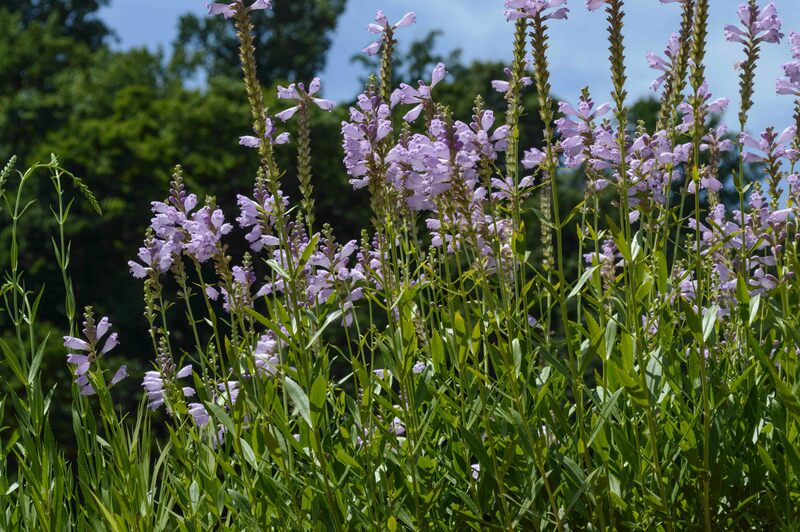 Although obedient plant has a large range in the eastern US and Canada, there are only a few scattered occurrences in Maryland, including Montgomery County. I found these stands among the bedrock outcroppings in the Potomac River upstream of Fletcher’s Boathouse in DC. Obedient plant is a perennial that grows to about four feet tall, with late-summer blooming flowers on tall spikes. 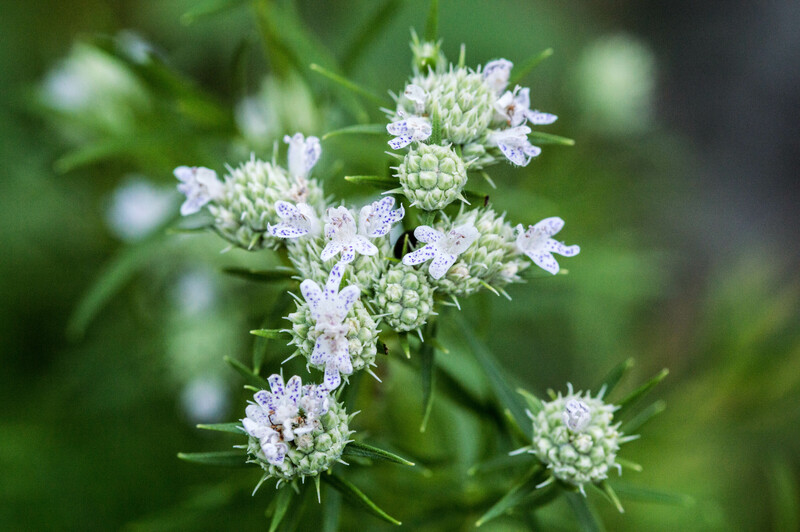 If it has plenty of soil moisture it can become aggressive, otherwise it makes a great garden plant that attracts bees, butterflies, and hummingbirds. This perennial species grows to three feet tall in rocky areas and drier soils, like the rock outcroppings just upstream of the Marsden Tract. In Maryland it’s found throughout the piedmont and most of the coastal plain; its larger range is from eastern Texas to Quebec. Flowers are borne in terminal cymes. 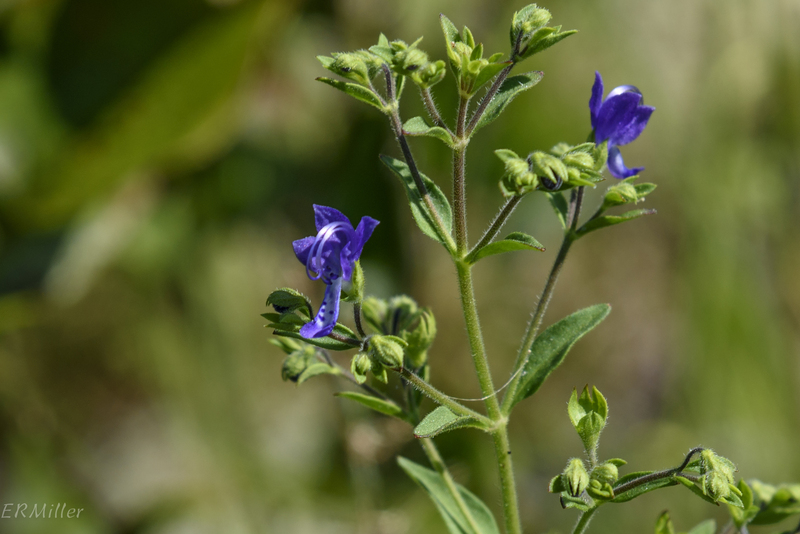 Like obedient plant, lyre-leaf sage is a native perennial that does well in the garden, growing to about two feet tall, with flowers borne in cymes on the upper part of the stem. It’s related to kitchen sage (same genus) but is not particularly fragrant. It grows in moist soils in full sunlight in every county in Maryland; its greater range is from Texas to New York, where it’s endangered. 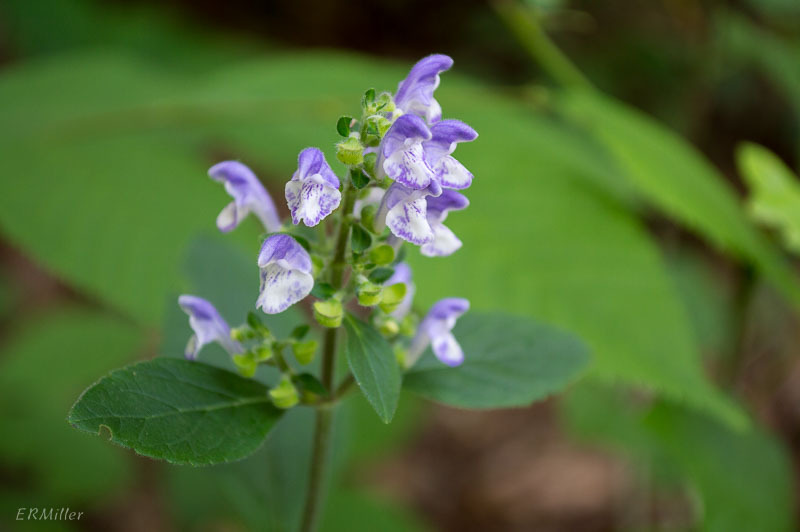 Hairy skullcap is a perennial that grows in drier woodlands; look for stands of it near Carderock and the Marsden Tract (C&O Canal NHP) in early to mid June, when the flowers on terminal racemes start opening. The species ranges from Texas through Pennsylvania, and is found in most of Maryland. When I was still fairly new to this hobby I found a few of these plants near the Marsden Tract. After a little while trying to shoot them with a macro lens, I went home to identify them. I was surprised and pleased to learn that I’d found an endangered species (S1, highly state rare), but sadly I have never seen the plants since, despite hours looking every May and June. 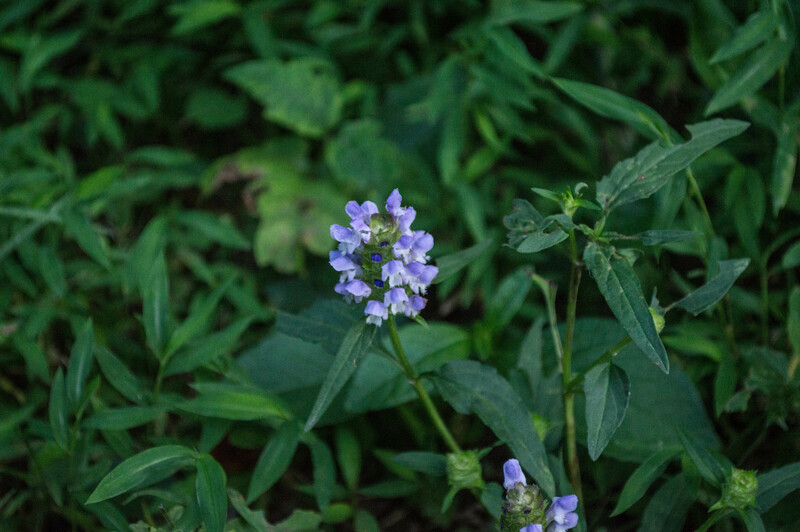 Veiny skullcap is a low-growing perennial, presumably liking rich, moist woodlands, since that’s where I found it. Flowers are borne singly or in pairs in the axils of upper stem leaves. This widespread perennial is found in all of the lower 48 states and most of sub-arctic Canada, and is considered weedy by some authorities. It grows to about three feet tall, with flowers borne on terminal racemes. 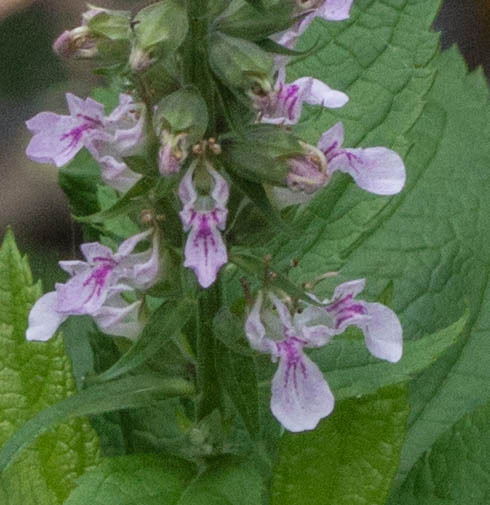 It’s in the same genus as the germander used in herb gardens, but has a much looser habit and likes much wetter soils. In the Potomac gorge I find it right on the floodplain, often in large colonies, particularly in late summer when the river is low. This annual species is widespread in the eastern US and Canada; in Maryland it’s found throughout the piedmont, coastal plain, and ridge and valley physiographic provinces. 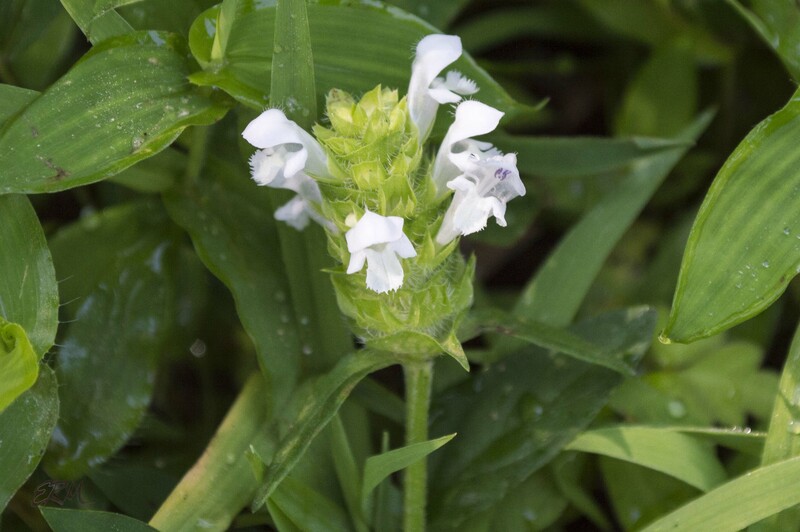 Look for it growing in drier soils in sunny areas. I’ve seen it by the dozens in Serpentine Barrens Conservation Park in Montgomery County, blooming in late summer. The plant grows to about two feet tall, with flowers borne in axillary cymes. 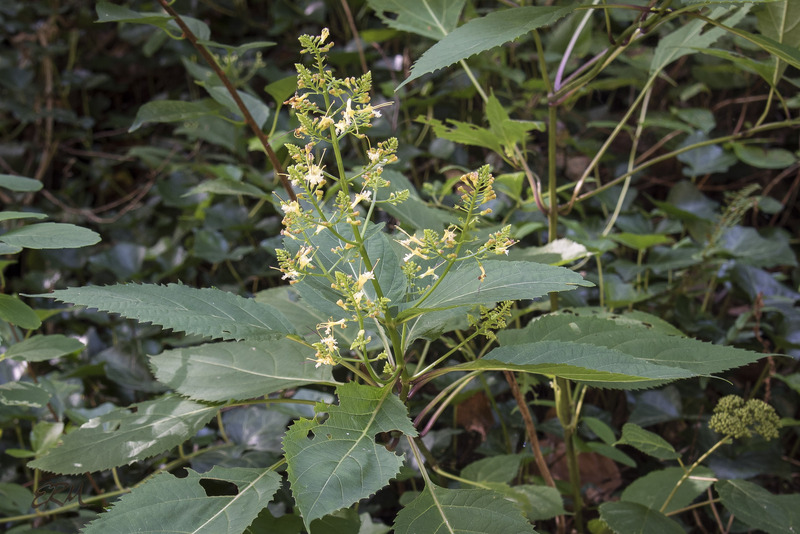 In addition to the weeds (see previous post), there are quite a few species of lamiaceous wildflowers found in the Maryland piedmont. Bloom times given below are based on my observations over the past few years. 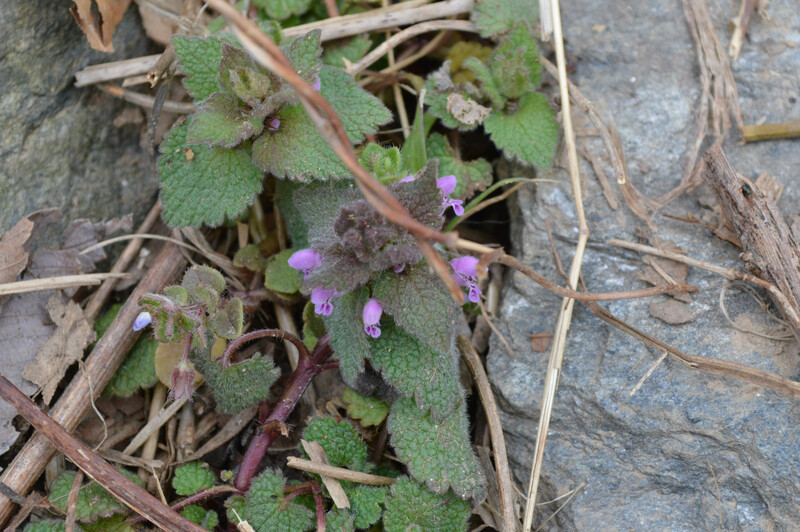 Wild basil grows in much of Maryland, but I’ve never seen it here; this specimen was photographed in central New York. It’s a circumboreal species; in the US it’s found in the northeast, midwest, Four Corners, and Pacific northwest. 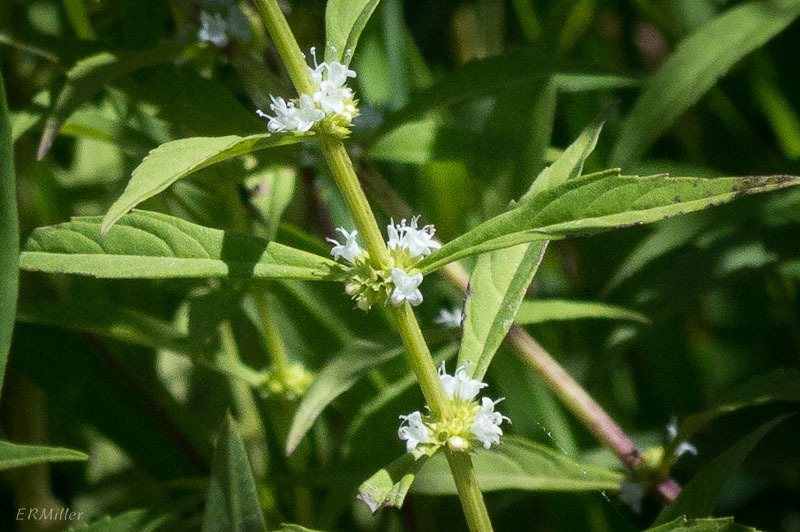 This is not the same species as culinary basil (Ocimum basilicum). 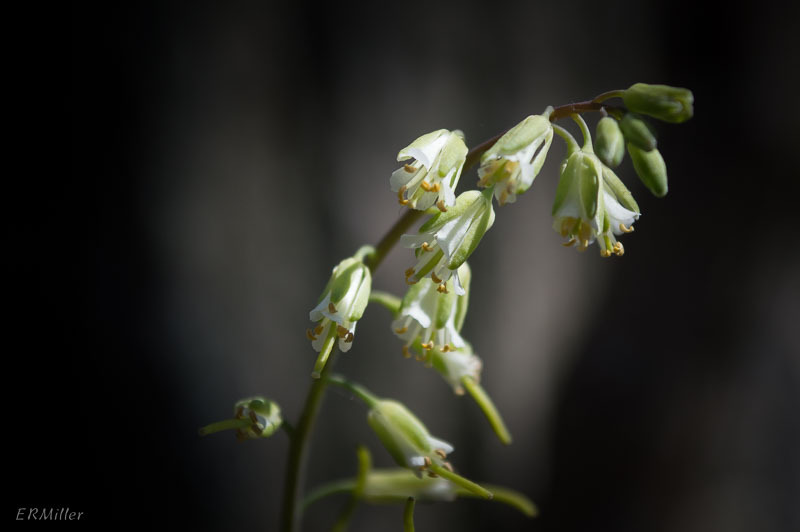 It grows to about a foot and a half tall in dry soils in sunny areas and open woodlands. Flowers are borne in cymes in the upper leaf axils. This species is found in most of Maryland (but only parts of the coastal plain). It’s native to eastern North America, and is endangered in Wisconsin. It’s a fairly large plant, growing to four feel tall with a three foot spread in sandy and/or loamy soils in woodlands. 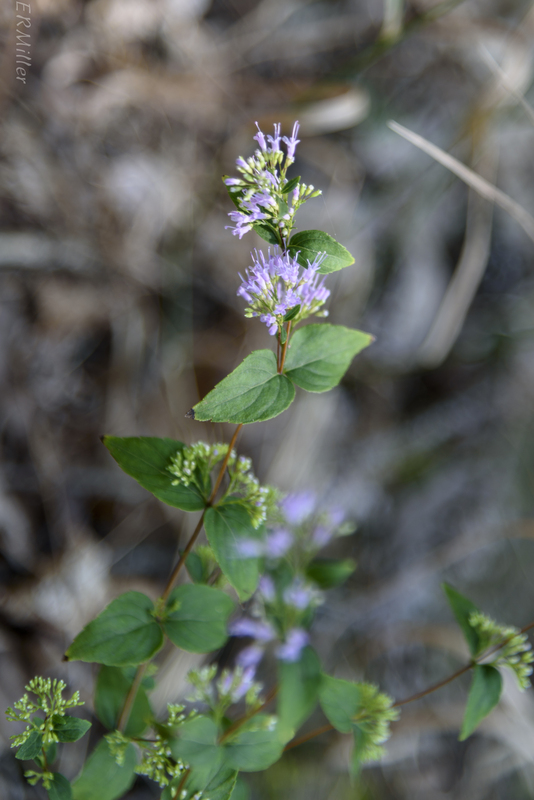 I’ve found two stands of richweed along the Cabin John trail; both sites are moist to wet and rather shady. Small flowers are borne on large terminal panicles in mid to late summer. Dittany is found from eastern Texas to southern New York late. There are records for it in most of Maryland, but I’ve only seen it once, in the woods at Serpentine Barrens Conservation Park in central Montgomery County. Dittany is a late-summer blooming perennial, growing to about two feet tall, with flowers borne in cymes or panicles in the upper leaf axils. Two very similar looking species, differentiated by leaf shapes, presence/absence of hairs on stems, shape of calyx teeth, and other little details. Both are moisture-loving perennials growing to about three feet tall, with tiny flowers in cymes in the upper leaf axils. The late-summer blooming flowers are not at all showy. This species is not one of the culinary mints, but like them it can be an aggressive grower. It’s a perennial that grows to two feel tall in moist soils with some sun, blooming in mid to late summer. Flowers are borne in cymes in the upper leaf axils. A circumboreal species, it’s found in most of the US, except in some southern states, and is listed as weedy by some authorities. 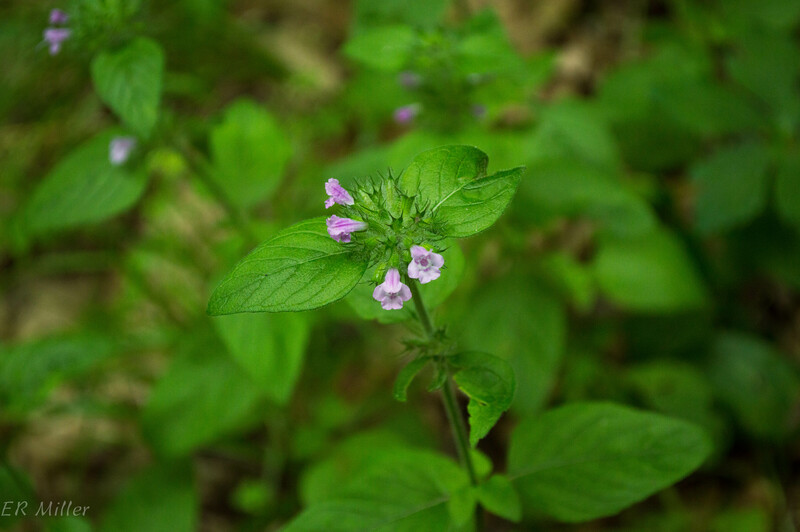 Basil balm is on the Maryland RTE watchlist (S3); it’s found only in the piedmont and a few areas to the west. 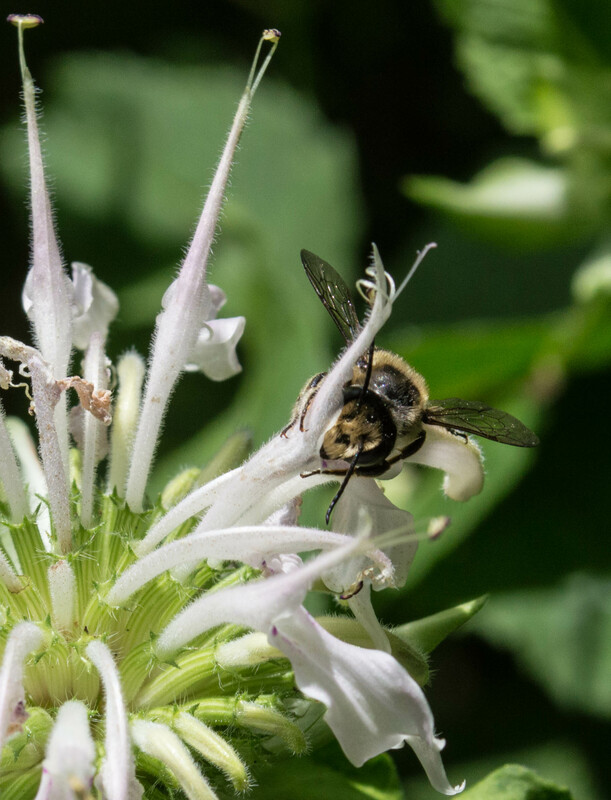 There’s one vigorous stand along the Potomac that I visit every year to see the bees carousing in the blossoms, from about mid June to mid July; like other Monarda species it’s a great attractor of pollinators. Its greater range includes most of the Appalachian states and parts of the mid-Atlantic, with some occurrences in southern New England and the midwest. It’s endangered in New Jersey and New York. 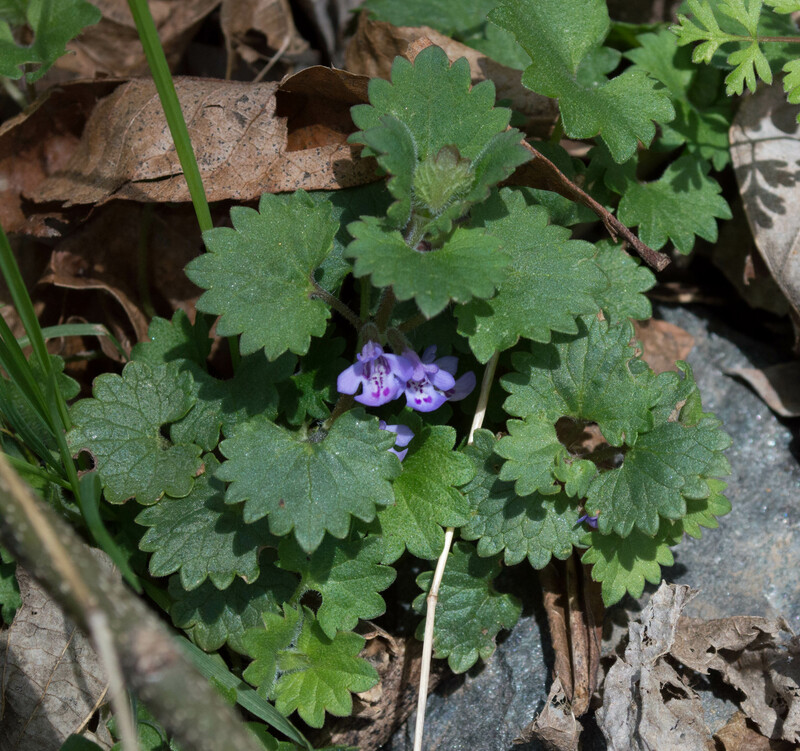 The plants stand to about three feet tall, growing in moist soils in open woodlands. The flowers are borne in terminal cymes. Except for California, Florida, and Alaska, and Rhode Island where it’s listed as historical, every state in the continental US has one of the seven varieties of M. fistulosa. In Maryland it’s found throughout the piedmont. Like many mint family species, this one can grow aggressively, spreading far and fast in ideal conditions. If you can keep it under control it makes a lovely garden plant that attracts several species of bees and butterflies. It can grow in sun to part shade, in many different types of soils, though it prefers drier ones. In humid conditions (eg, if overcrowded) it can develop mildew. 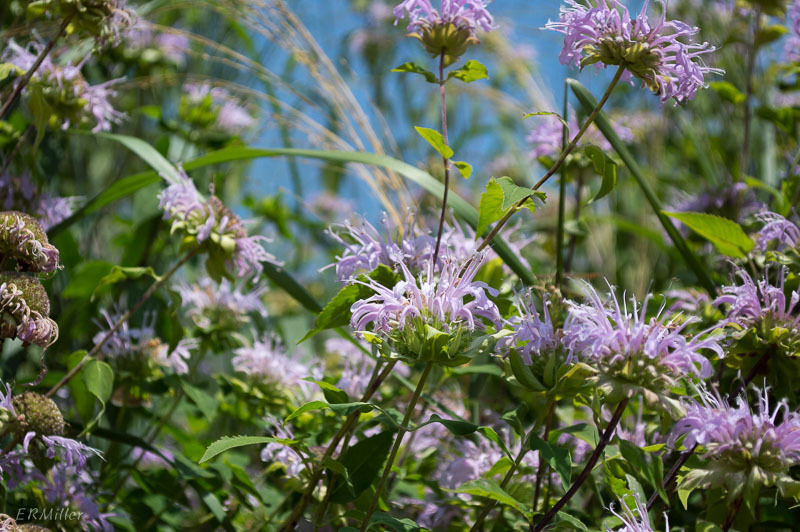 Bee balm is a many-branched perennial growing to about 4 feet tall. The flowers are borne in terminal cymes. Despite the common name, it isn’t related to the bergamot that flavors Earl Grey tea (that’s Citrus bergamia, in the Rutaceae). 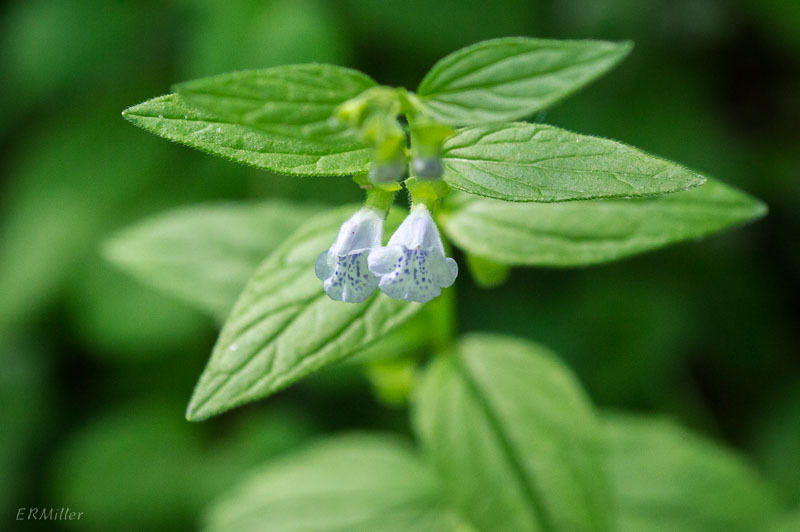 As familiar as weeds, as fragrant as mint, the Lamiaceae has a cosmopolitan distribution: about 7,850 species in 250 genera can be found almost worldwide (not Antarctica, and not north of the Arctic circle). Also known as the Labiatae, this family ranks 10th in size among native flowering plant families in North America, with about 408 species. In Maryland there are almost 100 species (more if you count sub-species and varieties), about half of which are in the piedmont. Sadly, only a little more than half of the species are natives, and of those, twenty-two are on the current Rare, Threatened and Endangered list. Two of those are extirpated. Mint family plants are well known as garden ornamentals and herbs (culinary and otherwise). 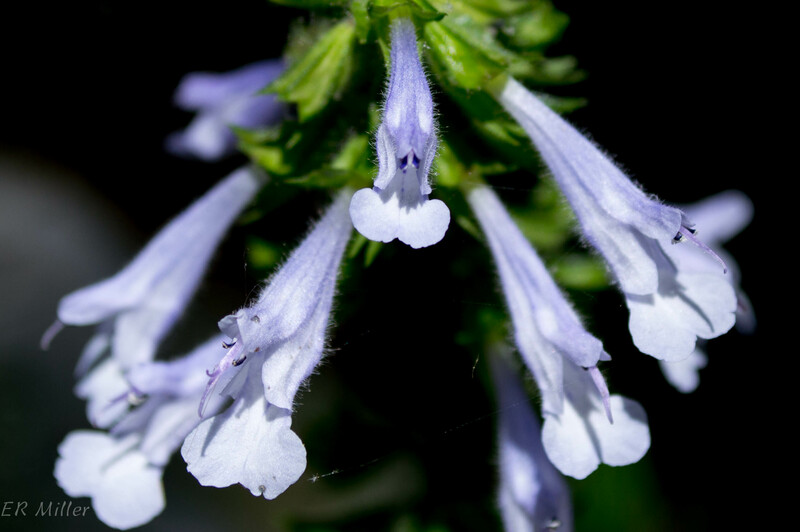 In the former category are agastache, bee balm (Monarda species), bugleweed (Ajuga species), catmints (Nepeta species), coleus, germander, hyssop, several sages (Salvia species), and stachys. Familiar kitchen species include basil, horehound, lavender, marjoram, the various mints, oregano, perilla, rosemary, savory, sage, and thyme. The mint family shows up in another way in many of our homes: as furniture. The three species of teak trees (genus Tectona) are in the Lamiaceae. 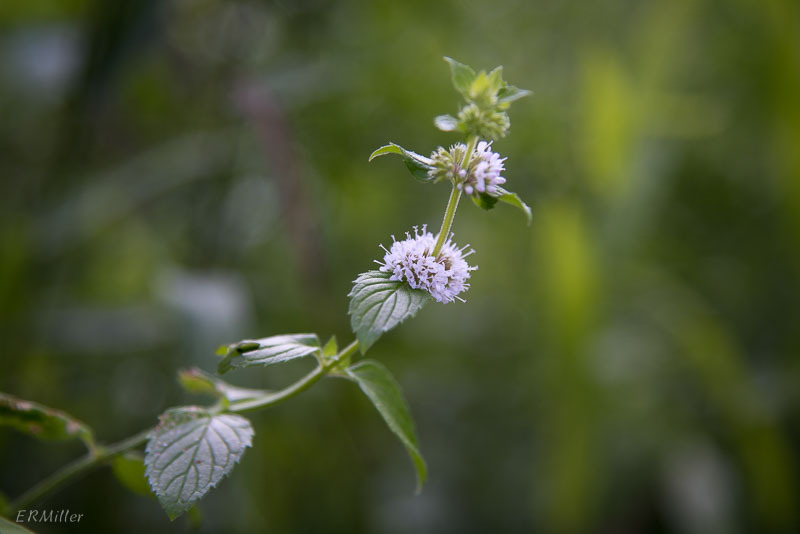 The mint family species are generally herbs, shrubs, or subshrubs, frequently with hairy stems that are more often than not square in cross-section. The leaves are usually arranged in opposing pairs or in whorls on the stem, and are generally simple, though they may be lobed or pinnately or palmately compound, and they lack stipules. They often have oil glands (many species are fragrant). The flowers are often found in whorls in the leaf axils, and are often scented. 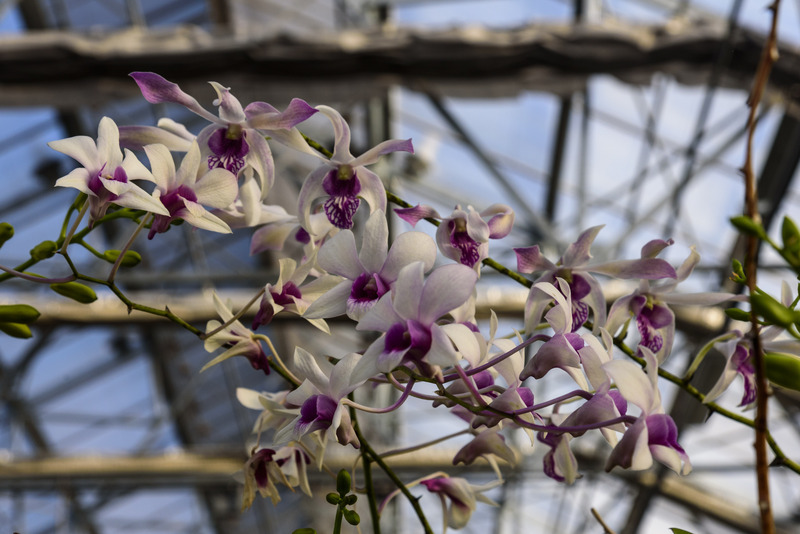 They generally have five fused sepals and five petals that are often fused or partly fused, giving the appearance of a two-lobed petal above and a three-lobed petal below. In some Lamiaceae species flowers are borne in cymes, a type of inflorescence that has several branching pedicels originating from the same point on the peduncle, along with a terminal flower that is always the first to open. 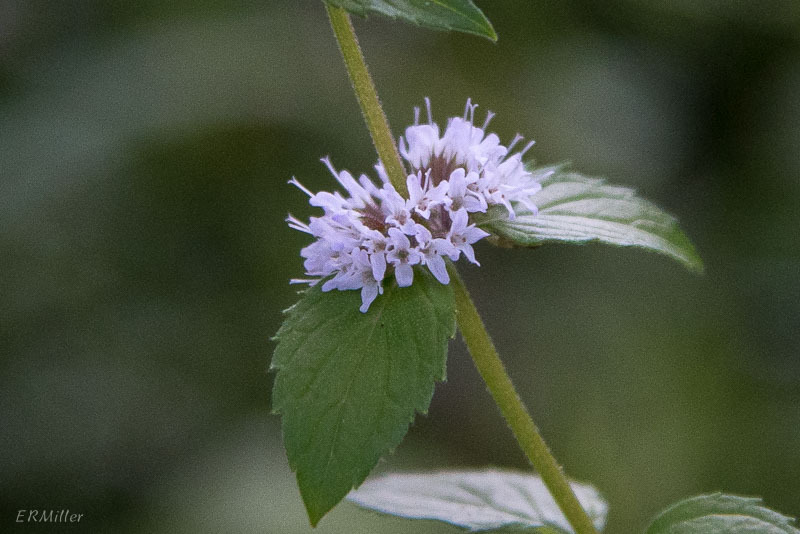 In the mint family these cymose flowers are often small and densely packed, with two opposing clusters; the effect is that of a whorl of individual flowers. Flowers can also be borne in racemes or panicles. Members of the mustard family (Brassicaceae) are widely known for their taste, utility, and ability to become weedy, but rarely for their beauty. After I’d written most of the previous post I realized that most of the brassicas I’ve seen in the Maryland piedmont are pretty weedy, with insignificant flowers. But there are lovely ones as well. For most of these plants, I’ve given the older botanical names as well as the current ones, since the older names often pop up in web searches and are in some of the classic wildflower ID books. 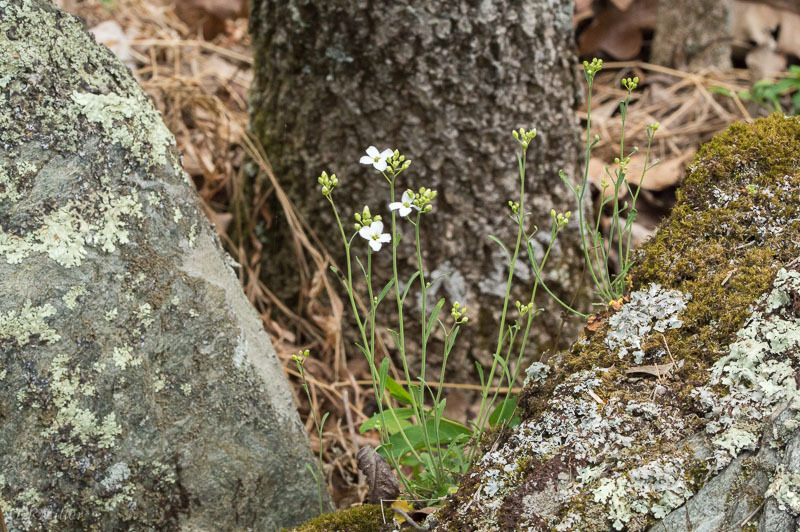 Smooth rock cress is found in rocky areas in deciduous woodlands, primarily in the midwest, Appalachians and New England. It’s threatened in Massachusetts and Maine. The plant is a biennial, growing a basal rosette in the first year, with a raceme of small flowers in the second year. The flowers don’t open up much, making them inconspicuous. Mostly you’ll see the green sepals, with the tips of the white petals just peeking through. 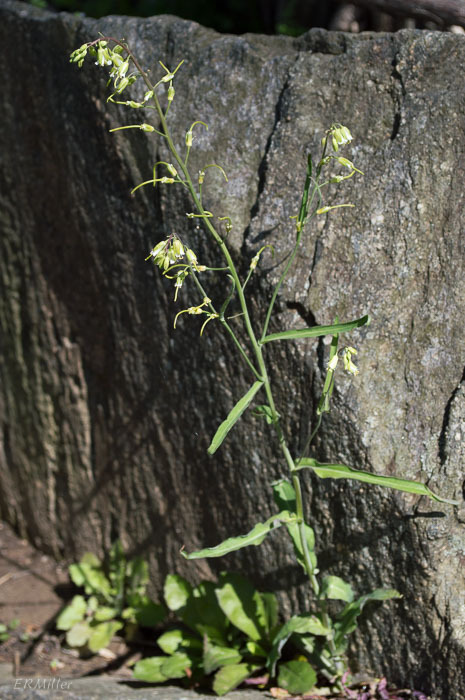 Lyre-leaved rock cress or sand cress is biennial or perennial with a wide range, including the Appalachians, New England except New Hampshire and Maine, the upper Midwest, much of Canada except Maritime Provinces, and Alaska. It’s endangered in Massachusetts and threatened in Ohio and Vermont. Look for it in sandy or rocky, dry to moist soils. 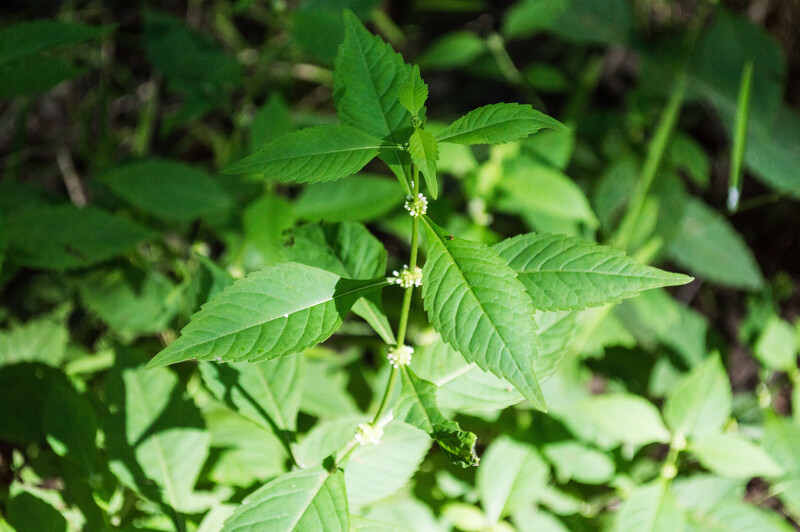 The basal rosette of leaves is small, and the raceme slender, giving the impression of dainty white blossoms hovering over the ground. In the Potomac gorge, I see them growing right on top of rocks. 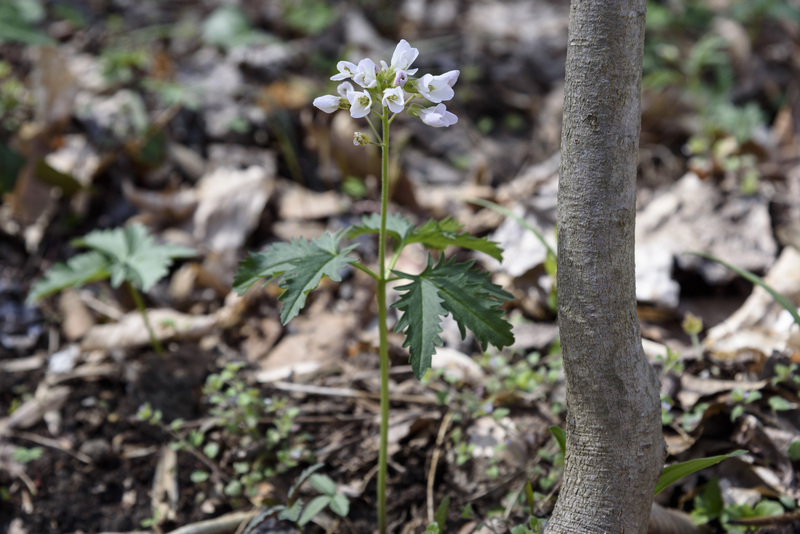 I think for many people in this area cut-leaved toothwort, also known as pepper root, is one of the highlights of spring. This species is a spring ephemeral, emerging from the ground, leafing out, flowering and dying back all in the space of four or five weeks. It’s found in the eastern half of the US and Canada, mostly in the midwest, mid-Atlantic, and New England; it’s endangered in New Hampshire and Maine. 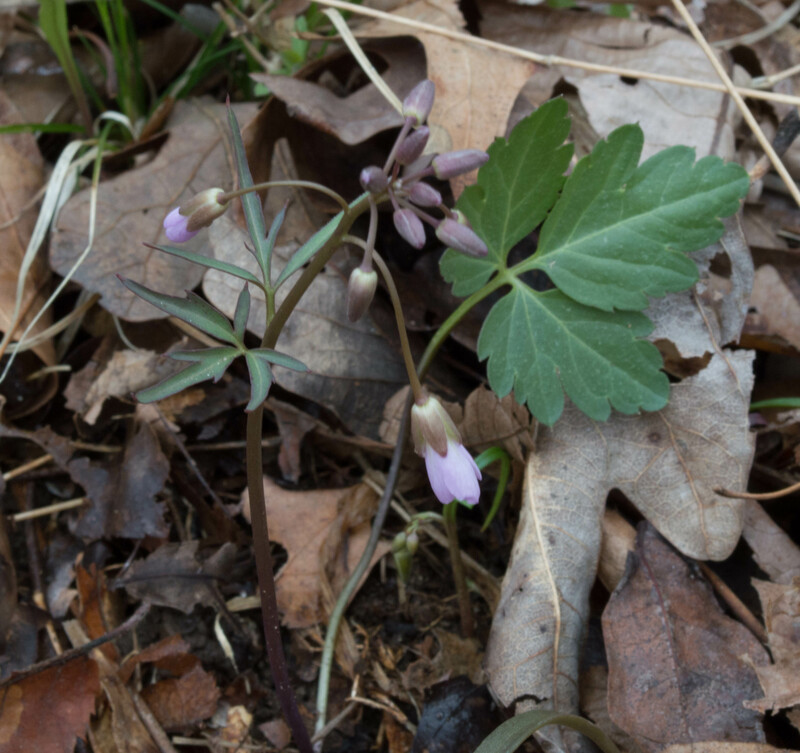 There are many species of toothwort, but this one is easily identified by the whorl of three palmately compound leaves on the flowering stem. The flowers can be pure white or have some pink or purple blush to them. Look for them in rich moist woodlands in April. About the time cut-leaved toothwort is fading, slender toothwort will be starting to bloom. 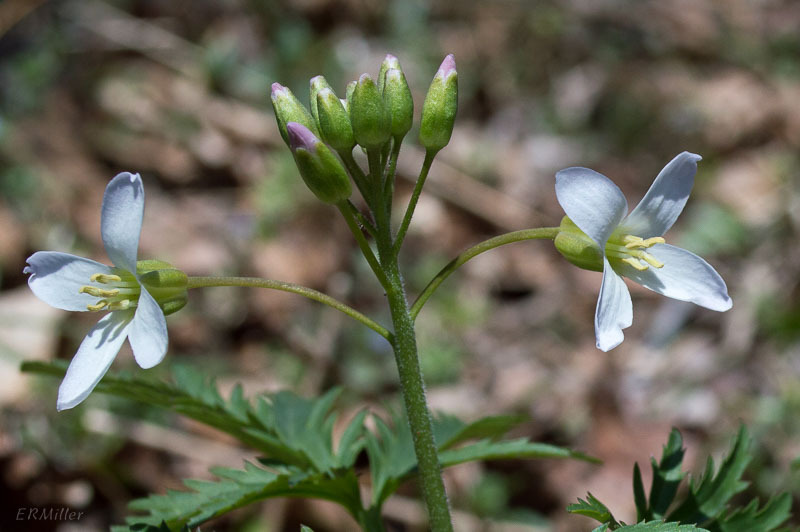 The flowers are almost identical to cut-leaved toothwort, but the two species are easily distinguished by the leaves. Slender toothwort will have two leaves at the node rather than three; these leaves are palmately compound with exceedingly narrow leaflets. The plant also puts out a wide basal leaf whose petiole is so long, you might not realize it’s part of the same plant. Slender toothwort’s range is fairly limited: it’s found mostly in parts of the south, midwest, and mid Atlantic. There are no conservation issues. Another note about trying to distinguish these two species: I’ve found many cut-leaved toothworts with only two leaves instead of three. Whether this is a response to environmental stress, or genetic, or whatever, I don’t know, but the shape and cut of the leaf doesn’t change. So if you see a plant with only one or two leaves any they look like they belong to cut-leaved toothwort, that’s what it is. Spring cress, aka bulbous toothwort, has a very similar inflorescence to the previous two species, but the basal lives are simple rather than compound and tend to be round, while the stem leaves are simple and oblong. 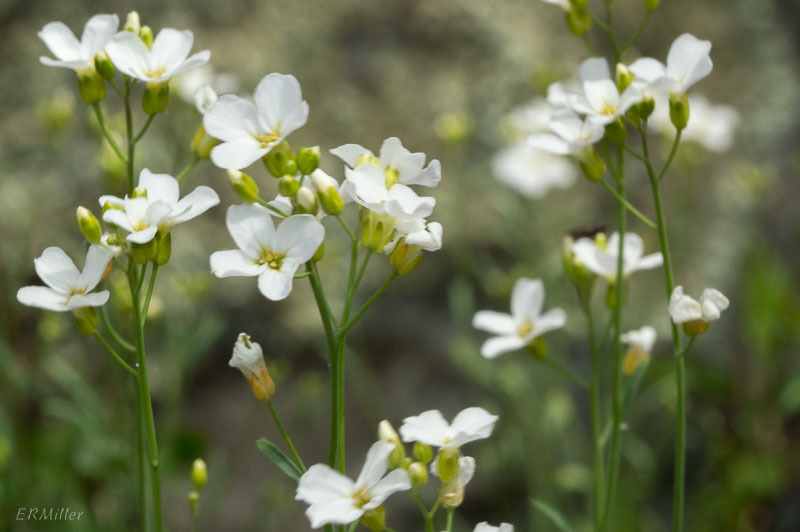 Also, spring cress grows in moist to wet soils in some sunlight (eg, open woodlands), a slightly different habitat. It ranges from the midwest to the mid-Atlantic and somewhat into new England. It’s endangered in New Hampshire. This circumboreal species is known as both cuckoo flower and lady’s smock. And in some areas, meadow cress and bitter cress. 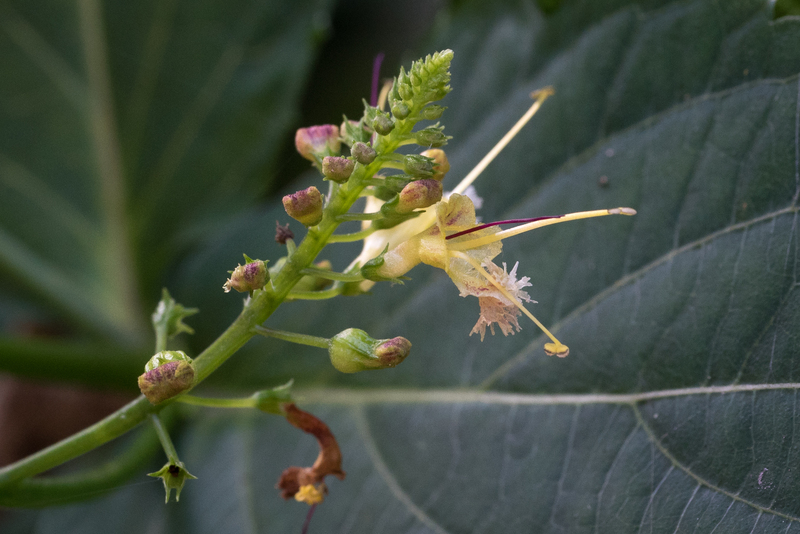 Maryland Biodiversity Project has records for it in a few counties, but as I wrote a few months ago the taxonomy of this group of plants is still unsettled. At any rate, the flowers shown here were photographed in Iceland. My ID could be wrong, and I regret not having good pictures of the leaves, but this is what the flowers look like. I’ve never come across it in Maryland, where it’s listed as S1, highly state rare. It likes moist to wet soils in shady areas. It’s Cardamine hirsuta (hairy bittercress), a particularly annoying lawn and garden weed. (Weed = a plant growing where it isn’t wanted.) C. hirsuta is a winter annual: the seeds germinate in autumn, and by winter produce these basal rosettes of leaves. In a few months the plants will send up slender flowering stalks, with tiny white flowers that are kind of pretty, if you’re a botanerd, anyway. But then those flowers will set seed, and at the slightest disturbance (like trying to pull them from the garden), the seeds will pop out explosively, in a surprisingly large radius. I have to admit up front that the mustard family is not my favorite. There are many weedy-looking brassica species in the Maryland piedmont, but at the same time some lovely early spring wildflowers. The fruits of brassicas are called siliques. Siliques are long and narrow, dry, and split open lengthwise at maturity, revealing a lengthwise septum (partitioning tissue). Almost all brassicas contain pungent compounds called glucosinolates, which give the plants a characteristic pepperiness (like the flavor of watercress). Possibly this is an evolutionary response to herbivory. I have read that all brassica species are edible, but for many people that may depend on the definition of edible. None are outright poisonous, anyway. Many of the brassicas also contain isothiocyantes, aka mustard oils. Worldwide there are a little over four thousand brassica species, in 370-some genera. North America has about 650 native species, making the Brassicaceae the sixth-largest flowering plant family on this continent. And in Maryland there are over 80 species, about half of which can be found in the piedmont, and more than 50 of which are alien. Four of the natives are on the watchlist (S3) and four more are ranked S1/highly state rare. Brassicas are important economically as ornamentals and food crops. Common garden plants include alyssums or alisons (Alyssum species), candytufts (Iberis species), dame’s rocket (Hesperis matronalis), and wallfowers (Erysimum species). 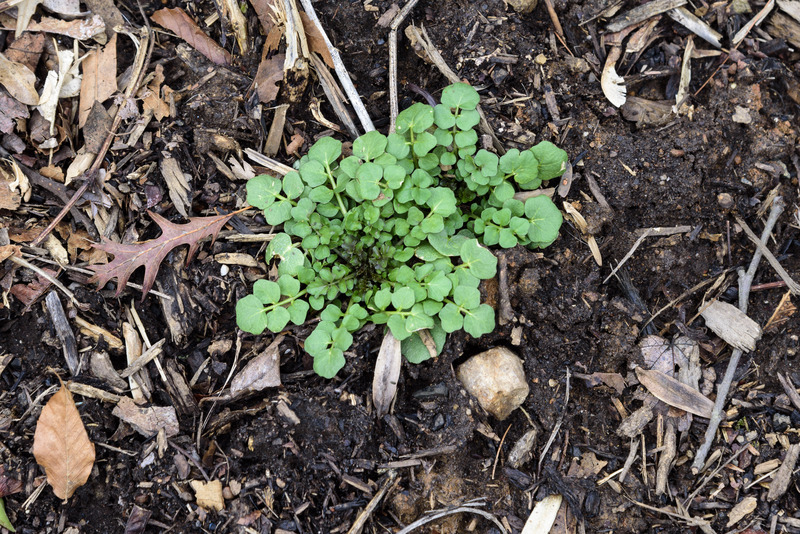 Brassica food crops include radish, horseradish, the various mustards, cresses, and wasabi. A surprisingly large number of our culinary vegetables are actually cultivars of a single species, Brassica oleracea: broccoli, Brussels sprouts, cabbage, cauliflower, Chinese broccoli, collards, kale, kohlrabi, Romanesco, and more.